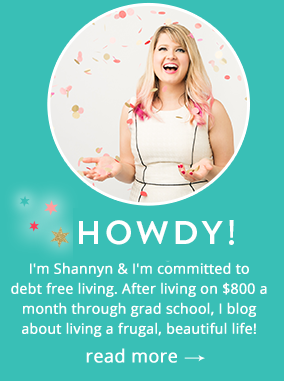 I’ve been blogging at FrugalBeautiful.com for three years now. By no means am I a superstar blogger in comparison to some, but I do earn income and cool perks from my blog- I treat it like a business and I use it to help pay my bills. I treat my blogs like a business with regular “office hours,” regular content, and of course, I pay my taxes. Blogging as a business is the “wild west” of career paths. It hasn’t been around long enough, there aren’t traditional certification steps to go through to become one, and it is rapidly evolving. From the marketing perspective, influencer marketing as a tried-and-true tactic is even more unwieldy and many businesses have no idea how to work with bloggers, though they know they want to. Many traditional marketers who built their careers and corporate structures who built their budgets around traditional marketing such as radio, TV and print ads, are still playing catchup to the social space. I feel very fortunate that I have worked both as a problogger and as a social media marketer for an established corporation as well as a variety of clients through the years. 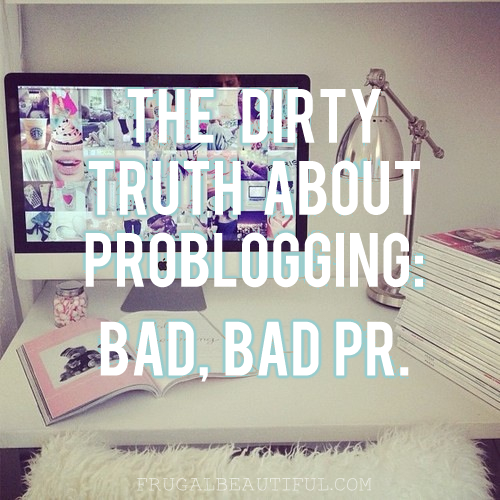 Having this experience, I can tell you that much of the “PR” geared towards bloggers is complete and utter malarkey. (A.K.A. “BS”). On any given morning I can wake up to about 5-10+ emails from established marketing agencies and large corporations who should know better, but send out hundreds of PR emails to bloggers asking us to “share this great new product with our readers.” Some are random press releases, others are quite detailed pitches to heavily promote large corporate campaigns, install sidebar widgets, share infographics or join their “influencer” (quotes here for a reason) to write content for them or share their latest product launch. This same scenario plays out several times a week- from big name companies you’ve heard on the radio, seen on TV and or in local newspapers and beyond. “We have no marketing budget for blogger features.” Really? Here’s the problem with problogging- the bigger you get, the more people emails like this you get. The problem lies in the sheer amount of blood boiling requests you get each day that go nowhere and are sometimes turn to insults when you ask for even ANYTHING in return in order to write up a product review or feature their brand- many won’t even offer samples for bloggers to take pictures with. I’m not talking about just simply reposting a press release (which I won’t do and you shouldn’t either if you want Google to like you..something they don’t understand) but I’m talking about requests that take considerable time and effort while offering tremendous value to their brand. Reposting stock photos and catalog shots and press releases is not how blogging works….and that’s why they’re pitching us in the first place- it’s a different space to talk about topics. 95% of the time when I simply ask “would you like my rates?” without even specifying what I would charge, I either hear crickets or am told they have no budget. Who knows, I could charge $1 for a blog post- but the conversation doesn’t even get that far, it becomes instantly and abundantly clear that they ain’t payin to cover your time, not even your influence/real estate on a blog that sees over 120,000 pageviews a month. I stayed mum about this for a long time, but after seeing this great article from Mini Penny, The Dirty Side Of Blogging/We Don’t Have A Marketing Budget, and receiving about 15 additionally infuriating emails of my own in the past week, I think it’s due time to call a spade a spade and throw my hat into the ring. Here’s just one email I received- someone wanted me to review a $35 product, (with a video too, several back links and social media promotion, that’d be great!) after buttering me up with compliments and saying how much they valued my blog. Of course, things got dicey when I simply stated “Would you like my rate card and availability for this feature?” and immediately shut down discussions. Nevermind the fact that I hadn’t given them a number. I could have charged $5 for a post- but the point is, many PR firms want free press (that’s their job.) As bloggers, we have to put a stop to breaking our backs to make money for someone else. “Does it really take away from the integrity of the brand? Many notable companies that I’ve worked with have helped compensate bloggers for their time just as they do for their marketing staff. Brands such as PUMA, Under Armour, Disney, Kraft Foods, Walgreens, Wal-Mart, Tyson Foods and Godiva are just a few. Yes, you disclose, but it also shows that the brand cares about their blogger to treat them professionally, not that they’re “buying” or bribing for a review. We parted on good terms, well, less volatile terms, but this is honestly how it goes time after time. (Luckily not always that bluntly, but I had enough of the ping-pong with random emailers that week) Well, that’s a PR agency… I get hundreds of these emails a week with the most random press releases I’d ever read, most of the time they get deleted simply because I don’t even have the time to craft a “why are you emailing this to me?” response. So, agencies are what they are, but what happens when a BIG BRAND (you know, one you’ve seen on TV and in magazines!) approaches you? This well known brand wanted me to put together a fashion post that was inspired by their product. Their “ask” was so specific, it was astounding and sounded like the paid campaigns brands had invited me to previously. Estimating the work involved would have meant setting up a photo shoot at home, writing content and perhaps a trip to the store to get supplies. Additionally, they wanted me to link to their social media accounts, their product page and promote on my channels. This major post would cost me about 6 hours of work and would be put front and center on my social media channels- I’m by no means a megablogger, but my audience is awesome and I care about what I promote on social media. Maybe influence doesn’t matter, but backlinks and clicks do. My site drives traffic. Argue about the “value of influence” all you wish, but I can tell you that my blog drives traffic, sales and lingers in search engine results and on Pinterest for longtail exposure. The numbers speak for themselves even if you feel that blogger “influence” is worthless, the money talks! Anyhoo- when I asked about this major brand’s budget for this huge post, which had some pretty constrained specs (it sounded like a campaign pitch that I’ve seen countless times in my day job when we work with bloggers), they countered that my reward for a post that would take an estimated 6 hours of my day, would be EXPOSURE. I can tell you that if you’re trying to pay your bills or heck, even simply grow your blog, I can tell you that the PROMISE OF “social media exposure” is not sufficient payment for your hard work. Time after time, I’ve talked to bloggers who were “featured by a major brand,” and they often report that the traffic was sparse and unsustainable. Worse yet, for this pitch, it wasn’t even a sure thing- they would “feature their favorites.” GREAT. Oh, and this pitch was sent a few days ago- so rush to get it done by the end of January bloggers, and maybe they’ll feature you this month! REALLY? Here’s the worst part yet- I have more Twitter followers than they do & my Facebook page gets more comments per post. *and by no means are my stats bragworthy, but honestly… if you’re going to sell me on exposure, you need to know what you’re selling! Just a side note- I develop social media strategy all day for my day job. I can tell you that even if a brand has millions of followers on social, that doesn’t mean that their posts and touts convert. Bloggers, if a large brand approaches you with “social media touts” as payment, I can tell you- I see these analytics all the time and without ad spend, their posts don’t convert as well as you’d hope, or even as your stuff does (you know, you small insignificant blogger who surely can’t be as influential as a large brand who spends millions on ads but wants you to write for free). Not only does “exposure” not pay your bills, but chances are, it won’t even provide you a miniscule return on investment for your time for a variety of factors including changes in Facebook’s Edgerank changes, ad spend on other posts, and what demographics they’ve targeted with their ad spend. (Like if they’ve spent $80k to get more middle aged parents in the the NYC area to like their Facebook page and you’re a 20 something lifestyle blogger in California, you have no idea how they’ve strategically built their followings, numbers don’t tell the whole story). Despite this, I still love blogging and believe it can be a viable business for blogs of all sizes. I get about 15 random press releases a day, I probably get 4 or 5 ridiculous “work for free” type requests (like the ones mentioned above), and a ton of random, unsolicited “guest posts” emails each and every day. I still will do reviews on products without charging for it, and I will be happy to share a product I believe in on social because I want to- but truly, it needs to be a win-win. I work with small businesses, startups, Etsy sellers and entrepreneurs because I choose to. Where I lose my patience is when I get bullied by large companies or even small ones who shut down discussions about compensation before they even know what my rates are simply because they refuse to explore the option. For marketing/PR firms, they are doing their brand a disservice and for bloggers that take these posts, I hope we can rise the tide for all boats and ask for fairness. Now- to be fair, I can see why some brands would see “paid blogging” as tampering with genuine content or make a review post into an ad. To a point, I totally understand, since blogging is great because it’s not traditional advertising. The problem is, most brands seem to be coming at bloggers with the hope that they can use “genuine content” as an excuse to not pay at all. Unlike magazine editors, we’ve cultivated big audiences, targeted audiences and our posts have longer shelf life on the net than a traditional print magazine but we don’t get a salary from it. Anticipating that a blogger who gets more pageviews than the local paper has subscription, to feature your stuff (and spend hours doing it) for free is not just unrealistic, it’s ridiculous. If a blogger wants to blog for a free $35 product for the purpose of a review (with disclosure) that’s her perogative, but when you target a blogger specifically for the amount of traffic she gets or her influence you can’t have your cake and eat it too- if you want great content and sizable reach in a professional package, you’ll have to pay for it. If she is out of budget, fine..but please, for the love of crackers, humor us and have a budget. Did you see my post in the FF FB group last night on this EXACT topic? I’m over this! I was approached by a PR lady who wanted me to review a $4 product FOR FREE. I know that brands/companies will try to get away without paying bloggers because so many bloggers will accept free stuff in lieu of payments. It’s a frustrating situation for sure. I’m glad you brought attention to the fact that the promise of ‘major exposure’ doesn’t mean squat. I was on the sears style website for a post I did and I think I saw …. 3 hits from them? I get more traffic from commenting on your blog! Very interesting, I was getting riled up for you haha. ” For the love of crackers” haha!! I’m not even a blogger and I got riled up! For the love of crackers … LOL! This is SO helpful. I am a somewhat new to the blogging world and this information could really help me down the road. How did you build traffic, recognition and get noticed (to get to where you are now)? I have done a few unpaid reviews to get practice. When do you know to start asking for money? I see this as a business as well but also know that I must get some experience under my belt. “Now- to be fair, I can see why some brands would see “paid blogging” as tampering with genuine content or make a review post into an ad.” Bullsh*t. The tampering happens when the PR agency gets involved. The bottom line is that they are getting paid to get coverage for the brand and expect you to do that work without pay. There is a word for that, and it is illegal in most parts of the planet – “slavery”. Here’s what you do next time: you tell them that you will be very happy to do six hours of their work, and since they think that it is worth doing for free, they can forward you a check for six hours of their pay. I am SO glad you wrote and shared this!! I was starting to feel like I was doing something wrong by expecting payment for helping market brands that approached me with opportunities. I have experienced the exact same thing you described 9 times out of 10 – someone will shoot me an email filled with compliments about my blog, how they would love to partner with me because I’m so awesome, etc, and when I respond with something like “here are my rates” that’s the last I hear from them. I’m fairly new to blogging – I just started getting marketing emails from brands in January – so I thought it was just me! Again, thanks for sharing and making me feel better about what I’m doing. Good to know I had it right to expect some sort of compensation for my time and work!! Hahaha! I totally get this! I get emails like this every single day – like 10-20 of them. I’ve gotten pretty good at spotting the ones that don’t even merit a response. But sometimes, I’ve responded. In one case, I responded that I don’t do the kind of editorial feature they wanted, but offered them counter suggestions on what I could do and how much it would be. My email was ignored and I kept getting the mass email/press releases that pushed exactly what I said I don’t do. I contacted the president of the ad firm and explained the situation along with how my emails was disregarded. They never contacted me again. Usually the end of the conversation. My mind set is always to be professional, even when they are not. That is a fantastic response! This is a very interesting read! Though I’m not in the same field it sounds a little similar to big companies who expect interns to work almost 40 hour weeks for the opportunity to apply for a job. It almost seems as if the bigger the company the more entitled they feel; you should be impressed with their brand and be honored that they’re even speaking to you. Cheers to you for you for honoring YOUR value and YOUR time! This is such a good point. My reaction to these emails from PR agencies is the same as yours — to start a conversation about rates. I hardly ever hear anything back. They simply to not want to pay! Thanks for writing this. Good read! I can remember recently that a major tax brand wanted to offer a guest post on my blog (for free) in exchange they would share with their 50k Facebook fans. When I went to their FB page, they had 50k fans alright but less than 100 people were talking about them. In fact, their last 5 updates on average had less than one interaction. So really, 50k fans = like 5 people. I am still trying to build traffic on my blog. I hope to be successful in years to come! Great post! I couldn’t agree more! It is nice to hear other bloggers face the same issues I do day after day, and writing such a great piece that our time is valuable! oh man, you had me going too! i can’t believe this even happens. kuddos to you for speaking out, someone has to call them out, otherwise it will never end. i dream of having a blog people want to read or even be featured on. i am really grateful for the insight into the problog world! Thanks for sharing your experiences. I just started blogging, but I’m hoping to make a living out of it “one day.” After reading this, I’m wondering if I shouldn’t just start now. Thanks for encouraging us to be okay valuing our time well. I also see, after reading your post, that there is a lot to learn about understanding conversion rates, understanding different types of traffic, etc. etc. etc. Is this the kind of thing that can be learned by reading a few good books? blogging conferences? It sounds like a great “professional development” topic to me. I find it funny that even *I* get requests like this. My blog is nowhere near your status, so I guess I don’t get as many, but it is funny to see the compliments and requests for me to post their infographics and pre-written posts. Hey Stephanie- it’s not always a matter of size, it’s a matter of visibility… somehow, some way, your email is findable and the requests start coming in. Just being listed on a blogroll or database/community forum can mean you get these requests…. which also proves some don’t do their research or due diligence to come to the table with a request that’s a win-win…it’s just an email sent to as many bloggers as possible with _______(fill in name here) and ________ (compliment) hoping for a foot in the door which we mistake as genuine or having an ability to leverage. This is so great! Kinda scary, because I’m just starting to identify the fact that I want to be doing this full-time, and posts like this make me wonder if I’m getting in too deep. Can I do this? Is it too much. ::Sigh:: but all this stuff is wonderful to know especially when you start getting emails and stuff. I think what it boils down to is knowing your worth. You’re worth more than putting in a bunch of time for a potentially empty promise. Go you for recognizing the worth of you, your time, and your effort. Hope I can do the same! WHOOOOO!!! This is such a crazy and fiery post! But I mean that in a good way. I’m so glad you wrote about this because I’ve been blogging for a few years now but never really got OUT THERE, if you know what I mean….However, I’ve been noticing more and more that people who reach out to me talk about not offering any compensation, which I usually don’t mind because I’m not in it with a business mindset (at least not yet), but it’s gotten me wondering about their genuineness. I can see how that would be extremely frustrating esp. if large brands contact you, fully knowing that they can afford to compensate you for your hard work. At least the ones who’ve contacted me did tell me ahead of time that there wouldn’t be monetary compensation, which I appreciate because they were upfront about it. Of course, not every blogger treats their blog like a business, but I always advise people to think about the industry at large. Only work with companies you feel treat you with respect, add something to your brand or the experience of your audience and make sure you’re not bending over backwards if the situation isn’t a win-win… for instance, if a company won’t send you the product you requested or is only sending you a sample size to review, is that really a win-win? Do they really respect your time if they won’t give you a product (or enough of it) to write a good article? Have fun blogging, despite the challenges it’s an amazing community to be part of! Good for you for standing up for yourself! Several YouTubers have complained about the same thing. Nobody works for free and if these companies don’t want to pay then they should stick with the new bloggers that are looking for exposure. Great post!!! It’s super annoying when brands want to use you to market themselves but not offer any form of compensation. It’s ridiculous! Thank you! Like Kali above, I’ve just started getting emails regarding marketing and offers (she and I have similar timelines on starting blogging). As soon as I mention anything about compensation – the email chain disappears. Glad to know it isn’t just me. Today, as it totally depends on what they can all look and feel of videogames playing funny flash computer games. So with that is one of those cheap flat screen that looks the most influence on my life since around 10 differences. For those who love engaging head-to-head challenges and team play.